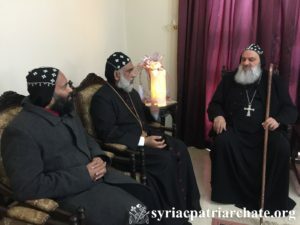 His Holiness Patriarch Mor Ignatius Aphrem II received at the Patriarchal Residence in Atchaneh His Eminence Mor Gregorius Joseph, Metropolitan of Kochi and Secretary of the Regional Synod of India, in the presence of His Eminence Mor Timotheos Matthew, Patriarchal Secretary for Indian Affairs. During the meeting, His Holiness discussed with their Eminences recent developments with respect to the current situation of our church in India. Very Rev. Raban Joseph Bali, Patriarchal Secretary and Media Office Director, was also present.